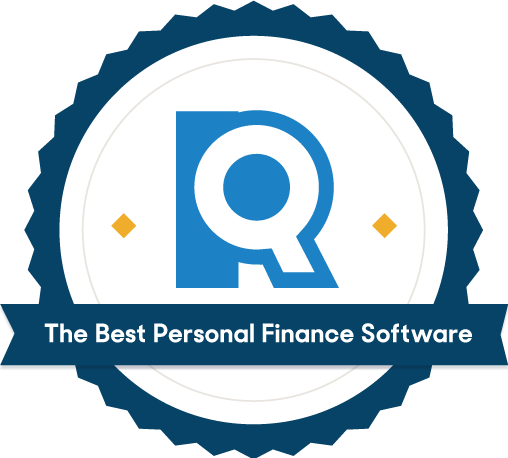 The best personal finance software bolsters your financial literacy and eliminates confusion. When you are able to keep track of the money that moves through your life, you’re better equipped to understand your spending and saving habits and hold yourself accountable to both short- and long-term goals. We pulled the data on every personal finance program we could find — 36 in total — then whittled down the list to the top-performing five based on security, functionality, device compatibility, and customer support. Making full use of a personal finance manager means handing over all of the bank account information and credit card numbers in your life. 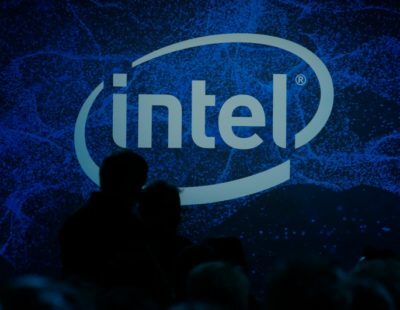 It's vital to have strict security measures capable of keeping all of that delicate intel protected. The first hurdle that finance apps needed to jump to meet our security demands was fairly low: an https:// domain name. That’s the secure version of plain old http:// and signifies that the website uses encryption to prevent third-party interception. We also verified that all of our top picks employ multi-factor authentication (like entering a username, password, and secret code received through text or email) and utilize 128- or 256-bit encryption and TLS 1.2 for transmissions. The gold standard for secure storage and transmission of data, these encryption protocols ensure that your information can’t be hacked. We verified that the finance apps offer versions for both iOS and Android and have a desktop browser version. Being able to keep tabs on your money on the go is a non-negotiable, and it would be a pain to have to hunt down a new program if you switch up your phone. Having access to your information from any computer is equally important. Mobile accounting is convenient, but a full computer screen experience allows for greater exploration. Quite literally, it lets you see the big picture — all the data on the screen at the same time. A personal money manager is a glorified calculator if it can’t automatically import your financial transactions. And if you’re going to have to manually enter your expenditures and income, you might as well make do with a spreadsheet. When personal finance software links up to a bank, it instantly reflects and categorizes transactions, balances, upcoming bills, and so forth, allowing you to move on to the real work of managing your money. We cut any software without this usability. It’s hard to find trustworthy answers to money questions online. When it comes to questions about how financial software is processing your data, you’ll want to be able to go to the source for quick, custom advice. An FAQ section, while helpful for general queries, is no substitute for getting in contact with an actual human. Finances are complex and personal. We required an option to get in contact via phone, online chat, or email for personalized assistance. Our cuts left us with six promising personal finance software programs to test ourselves. In exploring their functionality on desktop and mobile, tinkering with settings, tracking our finances, and building budgets, most impressed us with their intuitive design and helpful data sorting. Of them, only Mvelope confounded us with its less-than-ideal organization. With clunky calendars and over-large icons on the dated Flash interface, Mvelope just doesn’t have the polished visual simplicity of its competitors. Its layout and learnability issues resulted in our final cut. Mint uses insightful categories, crystal-clear graphics, and approachable language to tell you exactly what’s going on with your money. If you’re totally new to money management, Mint is the way to go. The simplicity starts with account setup. Mint links all of your accounts with the same bank in one fell swoop, so it only takes a minute to get rolling. Then it pulls two months’ worth of transaction history and begins categorizing. Intuit’s products (the other being Quicken) nail down transactions better than any other software we looked at. They even break down subcategories (think: “Fast Food” instead of “Restaurants”), making it easy to visualize and categorize your monthly spending. Mint (left) labels every transaction clearly, while Personal Capital (right) uses general categories. Mint uses a unique pie chart system to show you how your income and expenses break down, and it allows you to adjust these charts to show spending for specific categories, accounts, or time periods. This is a level of financial visibility we didn’t see anywhere else. It gives you deep insight into your own habits so you can check in and make adjustments if need be. 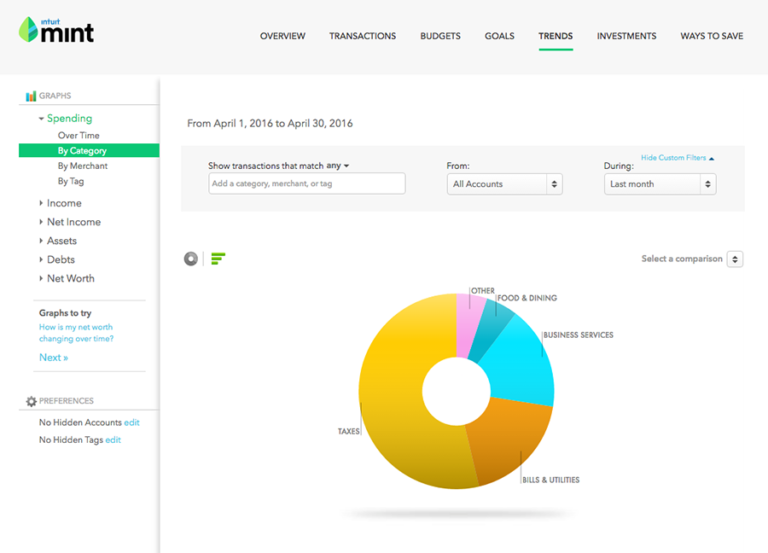 Mint automatically visualizes your spending habits, so you can see where your money’s going at a glance. 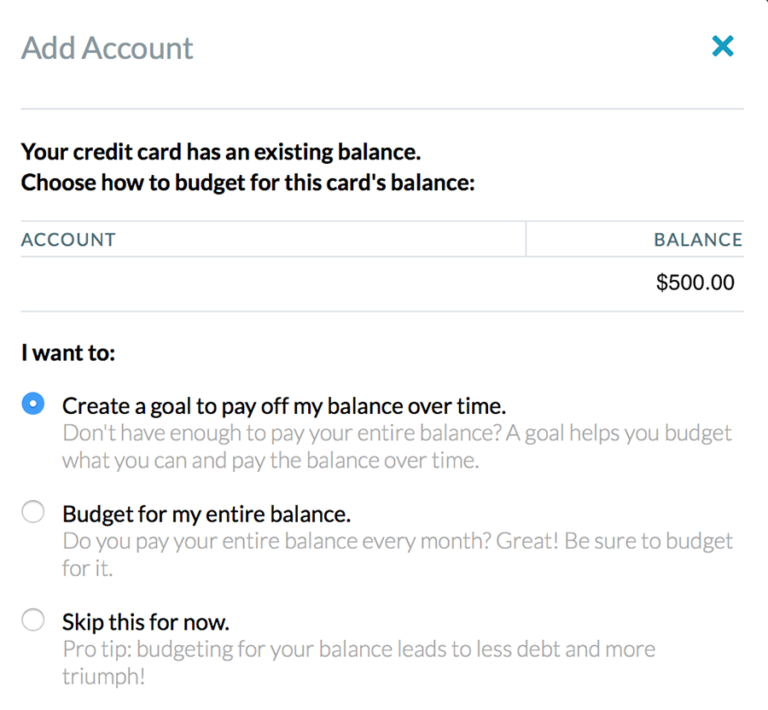 Mint allows you to create budgets for a number of categories. Start with the preset budgets, like "Restaurants" and "Transportation," or create as many custom categories as you like. After doing so, the software will automatically fill them in. We did notice that Mint isn’t as smart about labeling budgets as it is with transactions (it slotted a bus pass into “Education,” for example), but after a little tinkering, it’s great for automatically tracking your spending. With your budgets and savings goals shown in bar graphs like the one above, it’s easy to log in and make on-the-spot financial decisions. For instance, you can pull out your phone at the grocery store, look at your grocery budget, and decide whether to splurge on the $25 rosé or stick to the $10 bottle (without doing any frantic mental math). 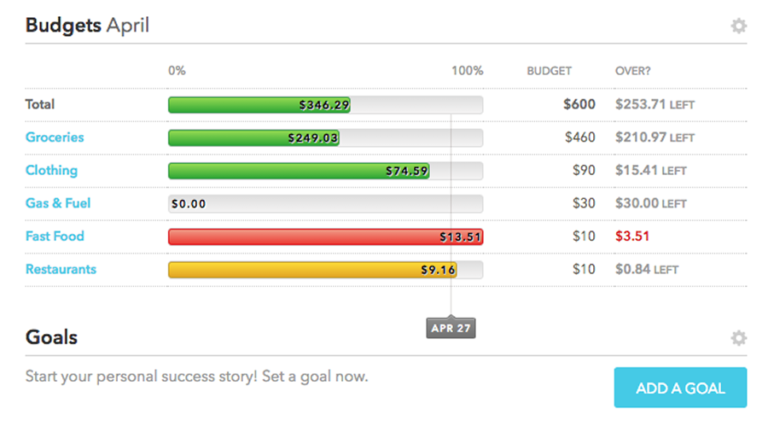 Mint shows your budgets clearly, so you can check in and see how you’re doing at a glance. We love that Mint is a free personal finance app — but that does mean putting up with banner ads. They’re not overwhelming, but you will have to scroll through some full-screen credit card and loan offers. If you’re looking for a more streamlined experience, we recommend checking out Quicken. For an ad-free experience, Mint’s fee-based counterpart offers an equally effective platform at $35 to $90 annually. Quicken is made by Intuit, the same parent company as Mint. It feels similar, with an equally user-friendly interface and tools, minus the distracting credit card and loan ads. Along with being ad-free, Quicken is a bit more robust than Mint. It uses a downloadable desktop app rather than a browser-based one, which has some perks. For instance, you can build out a calendar to track budgets, bills, and savings over time. To stay up to date with this calendar, the app lets you create customizable pop-up alerts for your desktop. It also has extra Report and Summary options — like “Net Worth Over Time,” “Spending Over Time,” and “Tax Summary” — that might be helpful for people with more accounts and assets. 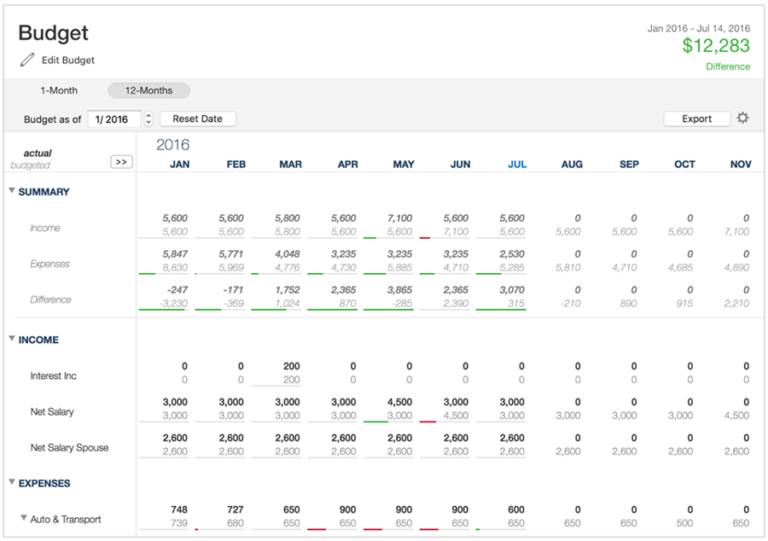 Quicken tracks your budgets, bills, and expenses in a customizable desktop calendar. We recommend this home budget software for people who are familiar with managing their finances and won’t need any hand-holding. Unlike Mint, which offers suggestion boxes — plain-English translations of what you should enter — Quicken expects you to be well-versed enough in finances to know where to find account numbers and the tools to run reports. Quicken is also a good choice if you have multiple accounts or larger assets to track since the desktop application is well-suited to manage built-out portfolios. Sheer capacity is one thing, with its wide array of tools, but security is another; everything is stored locally on your computer. It also allows you to see summary reports of your holdings, invaluable if there are too many moving pieces to otherwise view concisely. When we tested Quicken, all of its communication channels had long wait times (more than 30 minutes), with no indication of where we were in the queue — although they assured us that we could get shorter wait times by upgrading to “Premium Support” for an extra $50. Quicken does have a comprehensive Support section on its site to help you troubleshoot, and the software is intuitive enough that you may not have many questions if you have experience with money management. But we were still disappointed by its weak live support. 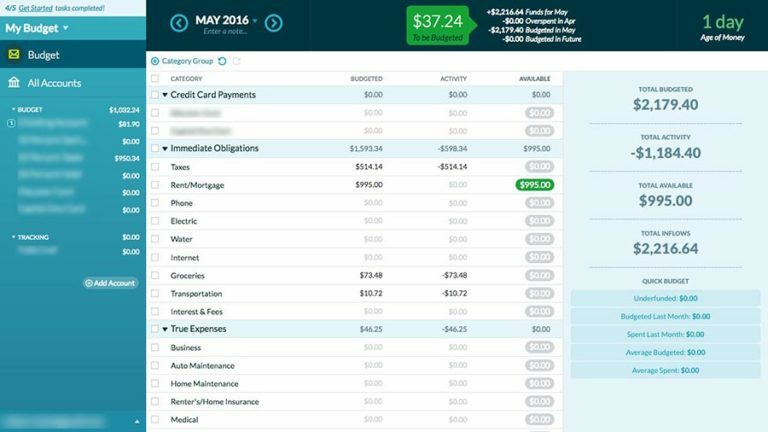 Quicken will cost you between $35 and $90 annually, depending on your operating system. If you’re on the fence about taking that leap, Quicken offers a 30-day money-back guarantee, so you can take the software for a spin and see if Intuit’s tools work for you. Quicken’s mobile app leaves a lot to be desired. While it has a decent rating on the Apple app store, it earns an abysmal 2.7 rating on over 2,800 reviews in Google Play. Most users complain about the app being slow — a real problem if you’re at the store trying to figure out if something is within your budget. Helpful online courses and step-by-step tutorials teach you how to break down income, successfully allocate funds, and even put some savings away. YNAB had us import each account separately, as opposed to pulling everything at once as Mint did. This took a little longer, but it made us think critically about how we wanted to prioritize our finances. For example, when we imported a credit card, YNAB asked us how we’d like to pay it off, then helped us work that goal into our budget. This setup process lays the foundation for thoughtful money management from day one. YNAB also walks you through budget planning with plainly worded, helpful tutorials. To really succeed, though, you need to take the Get Started Webinar before anything else. Trust us on this; we tried crafting a budget without it and were a little lost. What was Age of Money? What were Immediate Obligations and True Expenses and how were they different? Why was YNAB saying we’d overspent when we still had cash? Then we took the webinar, and everything clicked. These awesome resources take YNAB from a budgeting platform to a one-stop-shop for becoming financially responsible. One thing we really appreciate is YNAB’s flexibility. The company’s “roll with the punches” philosophy reflects the way we handle money in real life. Maybe you get a pricey Uber and overspend on your Transportation budget. No problem — you can log in, redirect some of your dining-out budget to cover it, and you’re home cooking (affordable) dinners in the black. Our other top picks didn’t make it as easy to reset our goals and stay on track. YNAB has tons of budget categories. You can choose which ones to use based on your individual financial needs. We’ll admit that YNAB isn’t 100% flexible across the board. It only asks you to budget for non-immediate expenses like “dining out” after you’ve fulfilled your “immediate obligations.” This is a sterner approach, and it may feel more prescriptive than our other top picks. But YNAB’s honesty about priorities is part of what makes the software so successful. Compared to our other top picks, YNAB is a bit of a one-trick pony. Everything relates back to your budget: Income, expenses, and goals are all presented in terms of dollars allocated and dollars to be allocated. This is great for keeping you on track, but it also means that YNAB lacks the trend graphics and other analytical lenses we loved from Mint, Quicken, and Personal Capital. Successful money management will hinge on whether YNAB’s specific lens works for you. 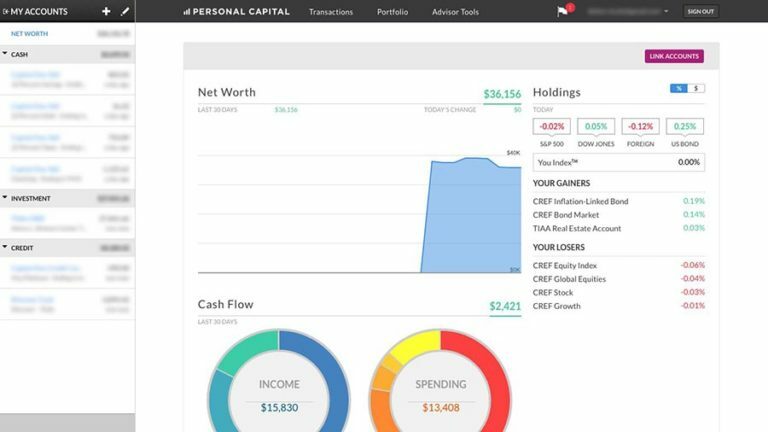 Rather than zeroing in on every transaction and budget category, Personal Capital gives you a high-level overview of your net worth and holdings. Personal Capital lets you monitor your finances without getting too entrenched in day-to-day balance changes. If you have unpredictable paychecks, for instance, it might not make sense to stick to a set monthly budget like that of YNAB. Or maybe you have unusual spending habits, like frequent business travel. In that case, using a transaction-focused software like Mint may not be particularly useful. Personal Capital offers a little more flexibility. It won’t send alarmist notifications if your accounts see a substantial change from one day to the next — as long as your net worth doesn’t suddenly bottom out. This big-picture outlook is represented beautifully on Personal Capital’s interface. 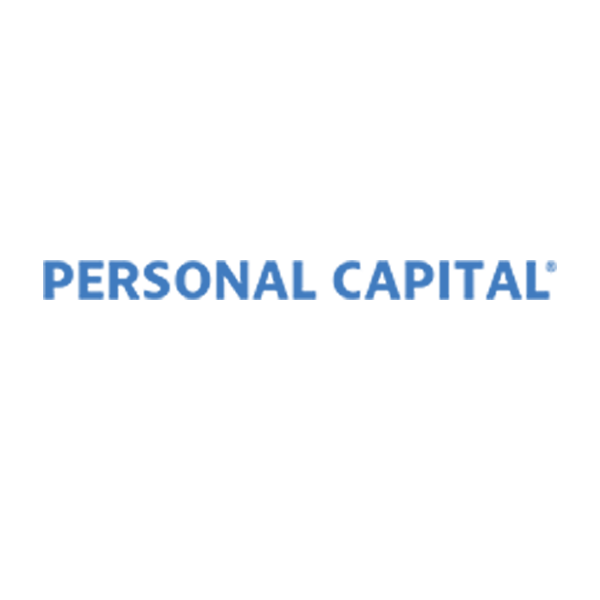 The first thing you see after logging in is your net worth, represented by a calming blue graph. Your overall cash value is clear at a glance, too, and you’ll know right away whether your worth is trending upward or down. You also have immediate access to income and spending trends: You can see, on a monthly basis, which categories the majority of your transactions fall into. This gives you a good idea of where your money is going and whether or not you need to make any high-level adjustments to your spending patterns. Cash Flow (otherwise known as “cash on hand”) is shown just above, so you know how much money is available to you at any given time. We loved how Personal Capital’s homepage tells you — both in real dollars and percentages — exactly how much your 401(k) or other investment holdings have changed. It also lets you know whether the Dow Jones, the S&P 500, and other major indices have earned or lost value, so you can keep track of the markets as you monitor your own investments. 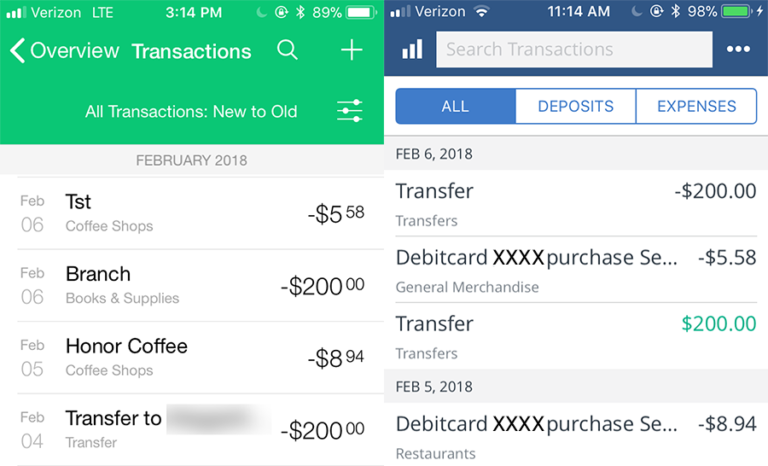 Personal Capital made getting started incredibly easy by importing four months’ worth of transactions right off the bat — twice as many as Mint. That meant we had immediate access to a substantial history of spending and savings trends. We didn’t have to use it for months to get a clear picture of our finances. Unfortunately, Personal Capital doesn’t categorize those transactions as well as Intuit or YNAB. Expenses are slotted into general categories (e.g., “Transfers” instead of “Rent and Mortgage”), and the way they’re listed doesn’t show the transaction location at a glance. This makes sense with Personal Capital’s macro-view outlook; just note that if you want to keep a close eye on transactions, this software will be frustrating. Personal Capital’s interface feels like it’s saying, “Hey, here’s what you have. Do with it what you will.” By comparison, the first things you see with Intuit software and YNAB are account balances, upcoming bills, and budgets. They feel a little more rigid — like an advisor counseling you about what you should be doing with your finances. Because it’s less focused on individual transactions and budgeting, we recommend Personal Capital for people who are already pretty financially savvy. This software will keep you in the loop about your finances without being overly prescriptive. Make positive changes to your money behavior with Clarity’s automated savings and prompts to cancel extraneous subscriptions. Monthly subscriptions can run wild if you don’t keep an eye on them. Between TV streaming and music streaming, magazines and newspapers, and those self-care shipments that are perhaps self-sabotaging your wallet, we let a lot of holes in our financial boats go unexamined. 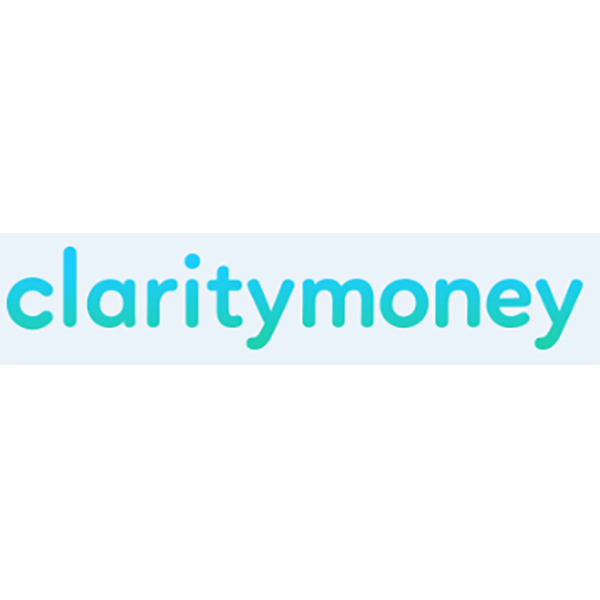 Clarity Money identifies repeat payments in your credit history to show you how much you’re spending. By organizing them in one place, and putting a Cancel button front and center, Clarity keeps you well-aware of your subscription spending. Most budget programs, free or paid, lack this one simple feature: the ability to structure a savings plan within the app. Clarity provides, prompting you to make easy savings commitments — like $5 every Tuesday for a rainy day fund — from a synced account. Making your costs more visible is something that most financial apps do very well. But what do you do with that information after you get it? Here, Clarity proves that it’s interested in improving your financial health, not just pointing out problems. The app spots negotiable bills in your credit history — things like cable and phone bills that invite haggling — and can automatically re-negotiate on your behalf. The app isn’t well-suited for varying income and expense amounts. If you receive the same paycheck every two weeks and your expenses stay more or less even month after month, you will have smooth sailing tracking your budget with Clarity. But if the gig economy means you cash freelance checks as you receive them, or run a business with seasonal spending, it could be frustrating to deal with Clarity’s freak-out notifications every time it perceives you are overspending (or under-earning). Before starting with a personal finance software program, have an honest conversation with yourself about why you need it. Maybe you’re starting your first salaried job and you want to learn to use your paychecks wisely. Maybe you have a hard time staying within your grocery budget. Maybe you want to save for a car or a house but don’t know where to start. “The most important thing is to know where you are weak and strong in your finances and then look for an app that strengthens those weaknesses and augments those strengths,” said J.R. Duren, Personal Finance Specialist at HighYa.com. Personal finance software can be a powerful tool, but remember: You only get as much out of it as you put in. Our financial experts all agreed on this point. 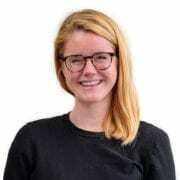 "What makes a [personal finance software] successful isn't just the app's features; it's how dedicated you are to using the app in order to reach your financial goals." It comes down to checking in often, paying attention to trends, sticking to your budgets, and making adjustments when things don’t go quite right. You’ll only be motivated to put in the work if you actually like using your software, so picking the right one is an important first step. If you’re not sure what features you need out of a personal finance app, we recommend trying out a few before committing to one. 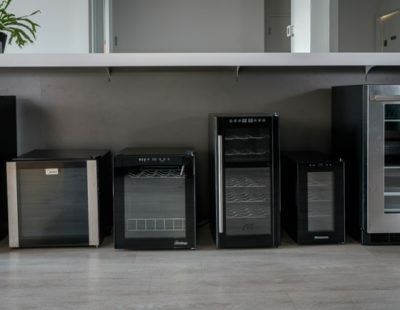 All of our top picks are either free or offer a free trial, so you can take them for a test drive and see which tools work for you. Don’t have time to check in on your finances daily? That’s okay. “Make a Money Date with yourself every week or every month,” suggests Meka West, founder and CEO of Penny Smart Girl. Make sure your transactions are categorized appropriately, check your spending against your budget, and see if you want to change any of your spending or saving habits before the next Money Date. Whether daily or monthly, the most important thing is that you stick with it. Remember: You don’t have to use every single feature. For example, Mint will prompt you to set long-term savings goals — but if that doesn’t inspire you, you can always just use its tracking charts to make sure you’re staying on track with your day-to-day financial needs. “With any new software, you have to dip your feet in and slowly immerse yourself in the features,” says West. “It kind of starts to come together after a month.” That may sound slow-going, but think of it like working out or healthy eating: You have to put in the effort and stick to your plan, but eventually you’ll see big results. Personal finance software gives you a (cheap or free) personal accountant wherever you go. It can help you set and stick to a budget, track what you’re spending your money on, and give you advice on how you can reach your financial goals. The 50/30/20 budget is a way to break down your expenses: 50% should go towards needs like groceries, housing, and car payments, 30% on wants like eating out, shopping, or events, and 20% should be saved. Most experts recommend devoting around 20% of your income to savings. That includes retirement accounts like 401(k)s and Roth IRAs, which are taken directly out of each paycheck. While this varies from person to person — an 18-year-old working their first job probably won’t have the same saving habits as someone near retirement — it’s still a good benchmark to aim for. You should aim to spend about 25% of your pre-tax income on rent or your mortgage. While that might not sound like much, keep in mind that you’ll likely still have to factor in additional expenses like utilities, TV and internet service, and possibly renters or homeowners insurance. Is Microsoft Money a good personal finance software? Microsoft’s budgeting software, MS Money, hasn’t been actively marketed or developed in several years. While you can download a 2012 version, you won’t find the same spread of customer support or tools as you will on more current personal finance apps. Looking for a Microsoft Money alternative? We’d recommend Mint.